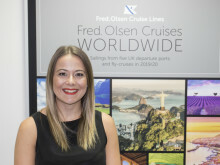 Following the cancellation by All Leisure Group (‘ALG’) of its Voyages of Discovery and Swan Hellenic cruise programmes and cessation of trading, Fred. 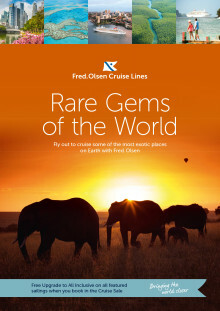 Olsen Cruise Lines is offering those ALG guests affected a 25% discount off the cruise fare on any 2017 / 2018 / 2019 Fred. Olsen cruise currently on sale, on bookings made up to 31st January 2017 inclusive, subject to proof of their original ALG booking. “We are saddened to hear the news that All Leisure Group has ceased trading. However, we want to help affected Voyages of Discovery and Swan Hellenic guests by giving them a Fred. 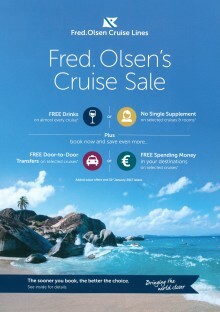 Olsen cruise option. To make new bookings, or to enquire about availability for guests, travel agents can book through all booking channels, including the Reservations Department on 01473 742424. A promotional code must be quoted at time of booking: VJAN25 for Voyages of Discovery-affected guests; and SJAN25 for Swan Hellenic-affected guests.